Rohatsu, or Bodhi Day, is celebrated every year around the world on December 8 to commemorate the day that Siddhartha Gautama experienced enlightenment. In Zen, we celebrate during sesshin, a retreat offering intensive practice of zazen (sitting concentration), kinhin (walking concentration), and samu (work practice). Sesshin literally means "touch the mind." This retreat is an excellent opportunity to experience true Zen practice, whether you are a long-time practitioner or just beginning. We will meet in the Center for Spiritual Living, housed in a beautiful and historic old brownstone in downtown Bakersfield. Those without prior experience are welcome! However, some beginners may find the rigors of Zen practice intense. For this reason, if you are new to practice, we ask that you email the director from the Contact page to inquire further. Also consider attending one of our regularly scheduled morning sessions to experience zazen before the sesshin. Friday, December 8: 6-9 p.m.
Saturday, December 9: 6-5 p.m. Payable by cash, check, or card the day of the event. The Dust Bowl Dojo will be closed through the month of July. We will return with normally scheduled Saturday zazen in August. Enjoy your summer! There are Zen Christians, Zen atheists, Zen mothers, Zen governors, Zen prisoners, Zen Jews, Zen Muslims. How can this be? Zen is not Buddhism, is not a religion, it is a practice available to anyone who wishes to live more fully in the here-and-now. Zen, simply put, is surrender to the simplicity of life. Can Episcopalians be Zen practitioners? If so, why would they want to be? Join members of the Zen Fellowship and St. Paul's as they discuss the relation between Zen and Christianity and how a Christian might cultivate a Zen practice as natural and vital as prayer. Gary Enns' book review of Nothing Holy about It (Shambhala Publications) by Tim Burkett, guiding teacher of the Minnesota Zen Center, is now published in Levan Humanities Review, Volume 5, Issue 1, 2017. In one instance, Burkett relates a dream he had about Suzuki [his teacher and founder of the San Franciso Zen Center] rolling, acrobat-like, into the dojo, passing two gigantic and surreal “Zen guys” sitting “like great mountains and taking up the whole zendo” (220). Suzuki, a tiny man brimming with joy and full of ease, tumbles around these stoic figures, smiling, beckoning Tim to join him, to experience the true happiness of life. 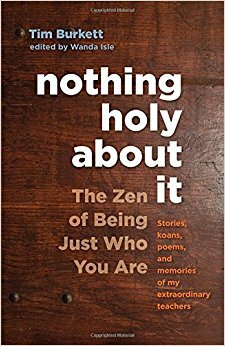 This dream, like all stories in the book, contains a potent message: living Zen means living authentically, joyously, being exactly who you are rather than striving to be something you are not. 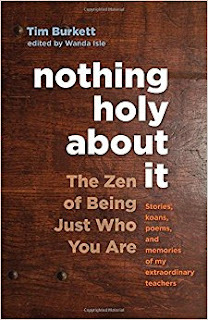 For the rest of the piece, visit "Wholeheartedly Present: A Review of Tim Burkett's Nothing Holy about It: The Zen of Being Just Who You Are." Here and Now Winter 2017 has arrived. Click the link or image below to read and download this edition of the American Zen Association newsletter.